An old wooden building of the lutheran church burnt February 2, 1940, after massive raid of Soviet aviation. To memorize the destroyed church the memorable board was settled. Stone cemetery chapel, built in 1939, was unfinished and during Soviet time was put on industrial use. Since 2001 this building on Fabrichnaya street is a property of parish of Karelia Evangelistic-lutheran Church. Sortavala parish of Estonia Evangelistic-lutheran Church was officially registered at December 19, 1990. After USSR dissolution, in 1992, the parish entered into new-founded Ingria Evangelistic-lutheran Church. During its first years the parish used a building of former fire-department on Karelskaya street. The local government gave an ample plot of land on Karelskaya street in support of the parish. The big project, covering the church and parish house building, was developed, but lack of money limited the project by only parish house. Project's authors are architects from Petrozavodsk – Viacheslav Bugashev and Viacheslav Shevliakov. The core stone blessing ceremony was held November 22, 1996. 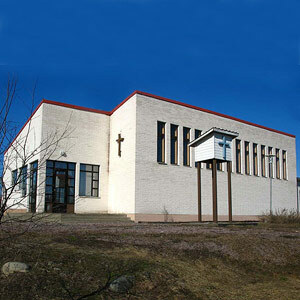 The construction was performed with economical help of Kuopio (Finland) diocese. April 5, 1998, the parish house was blessed by Ingria Evangelistic-lutheran Church bishop Aarre Kuukauppi and Kuopio (Finland) diocese bishop Matti Sihvonen.